Two New York Times Washington correspondents provide an inside account with never-before-told stories of the defining issue of Donald Trump’s presidency: his steadfast opposition to immigration to the US. As his campaign rhetoric in the 2018 midterms demonstrated, no issue matters more to Donald Trump than immigration. And no issue—with the possible exception of his opposition to Robert Mueller’s investigation of his 2016 campaign—better defines his administration. Julie Hirschfeld Davis and Michael D. Shear have covered the Trump administration from its earliest days. In Border Wars, they take readers inside the White House to document how Trump and his allies blocked asylum-seekers and refugees, separated families, threatened deportation and sought to erode the longstanding bipartisan consensus that immigration and immigrants make positive contributions to America. As the authors reveal, Trump has used immigration to stoke fears (“the caravan”), attack Democrats and the courts, and distract from negative news and political difficulties. Even as illegal immigration has fallen in recent years, Trump has elevated it in the imaginations of many Americans into a national crisis. Moreover, his comments about legal immigrants—Nigerians in their “huts,” Haitians infected with AIDS, and people from “@#$%hole countries”—have been incendiary. 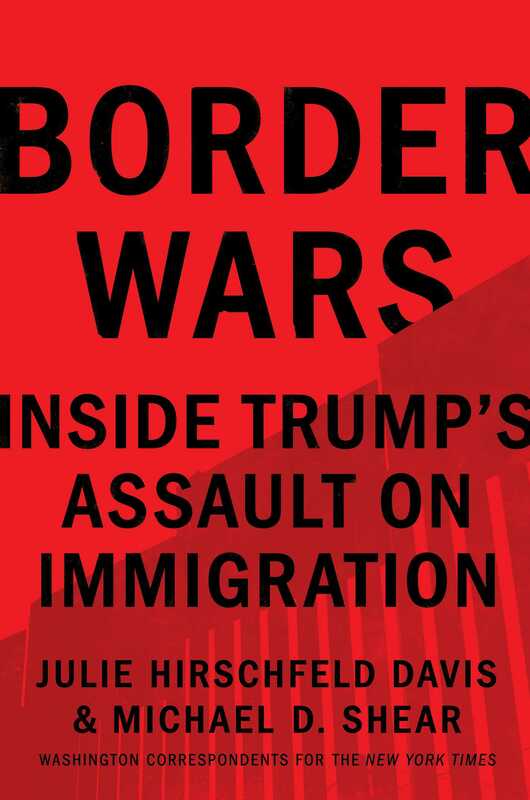 Border Wars identifies the players behind Trump’s anti-immigration policies, showing how they planned, stumbled, and fought their way toward major immigration changes that have further polarized the nation. This definitive, behind-the-scenes account is filled with previously unreported stories that reveal how Trump’s decision-making is driven by gut instinct and marked by disorganization, paranoia, and a constantly feuding staff. Julie Hirschfeld Davis is a congressional correspondent at The New York Times. She has covered politics from Washington for 21 years. She joined the Times in 2014 as a White House correspondent after stints at Bloomberg News, the Associated Press, The Baltimore Sun, and Congressional Quarterly. She won the 2009 Everett McKinley Dirksen Award for Distinguished Reporting of Congress. Michael D. Shear is a White House correspondent in The New York Times Washington bureau, where he covers President Trump. A veteran political correspondent, before coming to the Times in 2010, he spent eighteen years writing about local, state and national politics at The Washington Post, where he was also part of the Pulitzer Prize-winning team that covered the Virginia Tech shootings in 2007.